In Virginia, two of the top three statewide elected officials have admitted to wearing blackface several decades ago. While Gov. Ralph Northam has denied that he appears in the racist photo on his page of his medical school's yearbook, he did admit to painting his face with shoe polish while dressing up as Michael Jackson for a dance contest in the 1980s. Meanwhile, Attorney General Mark Herring admitted that he too wore blackface while dressing up with college friends as rappers. Those are the scandals stealing headlines, but Florida's secretary of state recently resigned for dressing as an African-American Katrina victim, again using blackface. Fashion house Gucci has pulled a sweater from its physical and online stores for its resemblance to blackface. 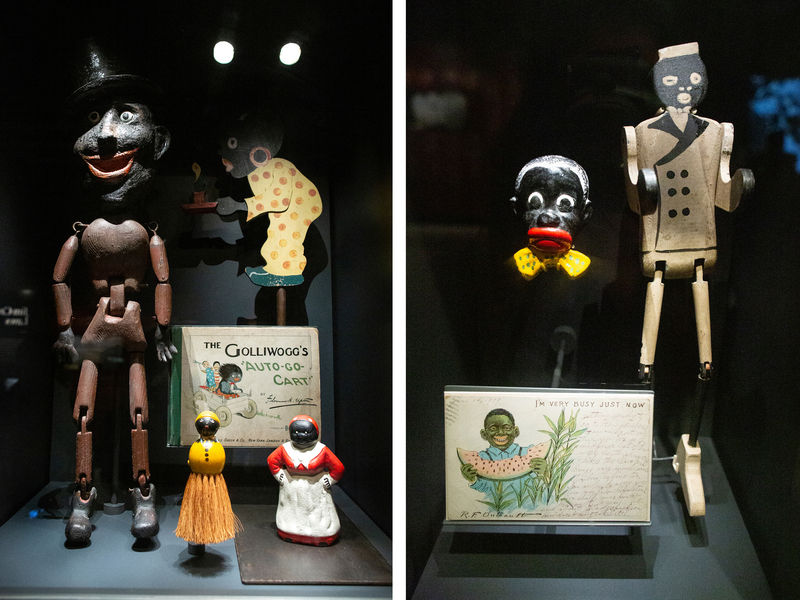 Wide-mouthed blackface figures of Uncle Tom and postcards of eating watermelon perpetuated negative stereotypes about African-Americans. The minstrel caricatures showed up on toys, games, books, postcards and everyday household items. Blackface has been around since the 1830s, first appearing in minstrel shows where white actors would perform as black characters. "They [were] literally watching black people in their moments of levity and privacy — it's being invaded and then co-opted and distorted. There's a violence to that," says Christy Coleman, CEO of the American Civil War Museum in Richmond, Virginia. That sentiment is reverberating across Virginia this week, even on the grounds of the state capitol. "Who is that funny to?" asks Kevin Williams, a businessman in town from Fredericksburg, Va. "It's just not funny. There's nothing funny about blackface." Williams is African-American and says he has lost faith in the elected officials caught up in the scandal. This week, photos from old yearbooks popped up on social media. Photos of college students re-enacting lynchings and blackface cartoons were shared thousands of times on Twitter, and many Americans began to ask, "Why?" 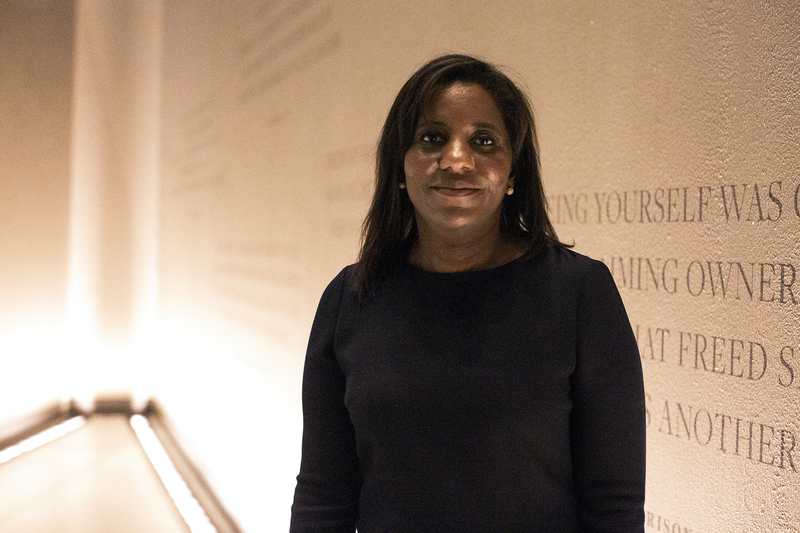 Dwandalyn Reece is the curator of music and performing arts at the National Museum of African American History and Culture in Washington, D.C.
"It's really the first truly American theater," says historian Gregg Kimball at the Library of Virginia. Kimball points out that minstrel shows were popular entertainment — and largely in northern and Midwestern cities, not the South. "I grew up in a small town in New Hampshire. When I cleaned out my great-aunt's house, there was a minstrel program. Our town had no black people in it. So this was not like a Southern thing. It was an American thing," he says. It was a form of American theater that used exaggerated stereotypes of black people. "They're lazy. They're unintelligent. They're prone to thievery, crooks," says Dwandalyn Reece. She's curator of music and performing arts at the National Museum of African American History and Culture in Washington, D.C. 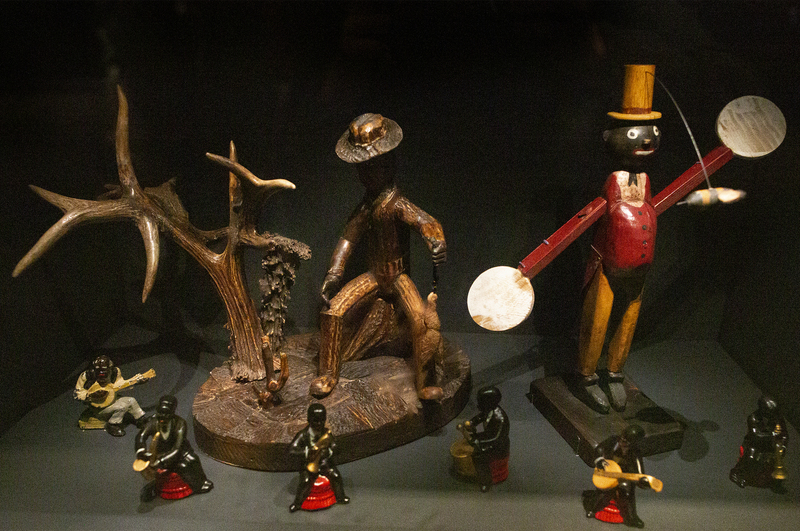 Objects and figurines perpetuated caricatures of African-Americans through small, ordinary household displays — many at the expense of exaggerating an "entertainer" persona and facial features. By the start of the 20th century, the racist caricatures were popularized in vaudeville and eventually radio, TV and film. In one comedy act called Two Black Crows, white actors stumbled about as naive and unintelligent black characters while wearing blackface, floppy hats and big white lips. Reece says a roster of these kinds of recurring characters developed into many that we may recognize today: "The mammy figure. There is also the figure of Jim Crow — Jump Jim Crow." Those caricatures proliferated and came to stand for segregation, racism, and the unfair and inhumane treatment of African-Americans, Reece says. For many Americans, particularly outside the South, these popular images were the only lens through which to view African-Americans. And it was a distorted view, Reece says. 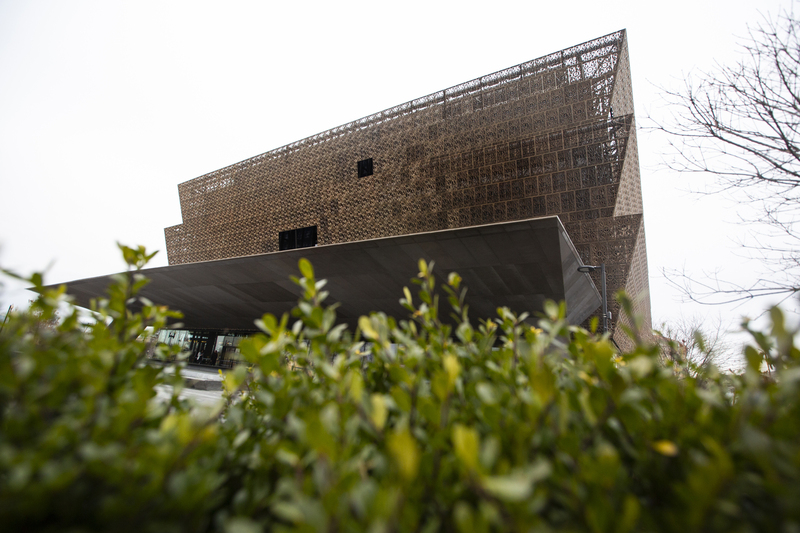 The National Museum of African American History and Culture in Washington, D.C. The minstrel caricatures started showing up on toys, games, books, postcards and everyday household items. Reece says there was a tremendous market for them. "You really see how it starts to shape people's attitudes around race and the prejudices and biases that come out of that." What's happening in Virginia, Reece adds, provides something visceral — and concrete — around which to have an honest dialogue about race and the dehumanizing impact of blackface. This week has people across the country looking back at their yearbooks. That's because Virginia has been rocked by political scandal involving an old yearbook photo and blackface. Both the state's governor and attorney general have admitted to wearing blackface decades ago. Florida's secretary of state recently resigned for posing as an African-American Katrina victim. And this week, the fashion house Gucci pulled a sweater that looked like blackface. NPR's Debbie Elliott has this look at the history and prominence of blackface in American culture. DEBBIE ELLIOTT, BYLINE: At the Virginia capital this week, Fredericksburg businessman Kevin Williams struggled to understand why anyone would blacken their face. KEVIN WILLIAMS: Who is that funny to? It's just - it's not funny. There's nothing funny about blackface. ELLIOTT: Williams is African-American and has lost faith in the elected officials caught up in the scandal. WILLIAMS: It's unnerving to me that there are people still today that think that that's OK, and it's just not. ELLIOTT: At the American Civil War Museum in Richmond, CEO Christy Coleman says there is a lack of understanding about blackface. CHRISTY COLEMAN: They are literally watching black people in their moments of levity and privacy. It's being invaded and then co-opted and distorted. There's a violence to that. ELLIOTT: Blackface has been around since the 1830s, first showing up in minstrel shows where white actors would perform as black characters. GREGG KIMBALL: It's really the first truly American theater. ELLIOTT: Historian Gregg Kimball at the Library of Virginia says it was an early form of popular entertainment and largely in Northern and Midwestern cities. KIMBALL: I grew up in a small town in New Hampshire. When I cleaned out my great aunt's house, there was a minstrel program (laughter). Our town had no black people in it, so this was not, like, a Southern thing. It was an American thing. ELLIOTT: An American thing that used exaggerated stereotypes of black people, says Dwandalyn Reece. She's curator of music and performing arts at the National Museum of African-American History and Culture in Washington, D.C.
DWANDALYN REECE: They're lazy. They're unintelligent. They're prone to thievery - crooks. ELLIOTT: By the turn of the century, the racist caricatures were popularized in vaudeville, and eventually radio, TV and film. Here's a record from 1928. UNIDENTIFIED ACTOR #1: (As character) Did you rob John Smith's henhouse? UNIDENTIFIED ACTOR #2: (As character) Oh, no, I never robbed no henhouse. No, sir. I was home that night. UNIDENTIFIED ACTOR #1: (As character) What night? UNIDENTIFIED ACTOR #2: (As character) The night I robbed a henhouse. ELLIOTT: That's a recording from New York of a comedy act called "The Two Black Crows." The white actors wear blackface, floppy hats and have big, white lips. Reece says a roster of these kinds of recurring characters developed. REECE: The mammy figure. There is also the figure of Jim Crow, "Jump Jim Crow." ELLIOTT: A PBS series recreated "Jump Jim Crow." THOMAS RICE: Come listen, all you gals and boys. I'm just from Tuckahoe. I'm going to sing a little song. My name's Jim Crow. REECE: And creating that caricature, it proliferated and came to stand for segregation, racism and treatment - unfair and inhumane treatment - of African-Americans. ELLIOTT: Reece says for many Americans, particularly outside the South, these popular images were the only lens to view African-Americans, and it was a distorted view. You can see that through exhibits at the museum. REECE: Over here, up here, we have a Sambo figure with a blackface with enlarged white lips and then the laughing figure with the big, bulbous eyes and red lips and mouth. ELLIOTT: The minstrel caricatures started showing up on toys, games, books, even postcards, everyday household items. Reece says there was a tremendous market for them. REECE: You really see how it starts to shape people's attitudes along race and the prejudices and biases that come out of that. ELLIOTT: What's happening in Virginia, Reese says, provides something visceral and concrete to have an honest dialogue about race and the dehumanizing impact of blackface. Debbie Elliott, NPR News, Richmond, Va. Transcript provided by NPR, Copyright NPR.